Atleast Eleven policemen were killed and more than 40 injured when a suicide blast occurred near a police vehicle in Razzaqabad area of Karachi Thursday morning, Geo News reported. 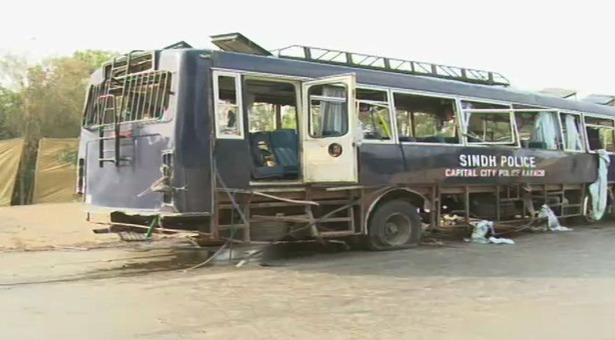 According to the initial report, the incident occurred in Razzakabad near the police training center where eleven cops were martyred and over forty injured when a suicide blast took place near a police bus early today morning. SSP Malir Rao Anwaar told that evidences indicate that a suicide bomber had rammed the explosives-laden vehicle into the police van carrying more than 50 personnel who were on their way to discharge their duties at Bilawal House. However, police is investigating the matter to ascertain the facts. Security forces cordoned off the area and sealed the blast site. The dead bodies and injured were shifted to Jinnah Hospital for medico-legal formalities and treatment respectively where six policemen were said to be in critical condition, according to the hospital sources.